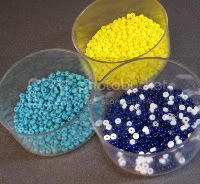 A summer Beading Daily blog post on Cellini Spiral describes a finicky sort of beader who buys beads and components for projects in the exact quantities needed - down to the exact number of seed beads and all. Not only does this sound frustrating to a bead collector like me - all those counts and calculations! - but it doesn't sound like much fun either. One of my greatest sources for inspiration is my collection of beads. Each time I pull out my carefully organized trays, I discover a new combination of colors and shapes to use. These pretty blue rectangle shells have been calling to me for some time now, waiting for the right bead partners or color palette to set off my creativity. I have been having so much fun with shell coins and ovals lately that I was determined to finally put them to good use. As I was mentally sketching different patterns and ideas, it occurred to me that by pairing them with round shells, I could create the dots and dashes patterns used in Morse code. I considered many different palettes to use with the rectangles, and finally decided on a nautical combination of yellow, white and navy blue. I also added some teal colored 11/o seed beads to tie everything together. For the Morse code dots, I used yellow shell coins, which are roughly the same size as the blue rectangle "dashes". The most obvious pattern choice for a Morse code design is, of course, S.O.S. I strung the circles and rectangles between seed beads, alternating between bright sunny yellow and a combination of white and navy. To make the beadwork strong, and keep it metal free, I tied off the threads in two peyote stitch circles - they bear a convenient resemblance to the portholes on a ship! When I first started experimenting with beading techniques and combinations of stitches, I surprised myself by coming up with what I would eventually call the "Athena Bracelet". 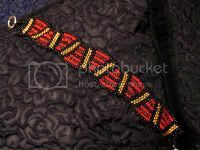 By combining peyote stitch with single strands of beads in alternating lengths, a wavy pattern emerges. The first two bracelets I made reminded me of motifs on Greek pottery - hence the name - and I made several more with different colors and patterns. 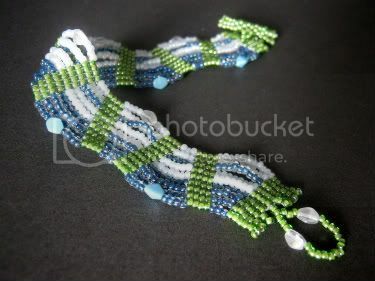 Although the beadwork has a soft, fluid look, the short rows of beads are actually quite sturdy, and the entire bracelet band keeps its shape while being worn. Since I've had the sea on my mind, I decided it was time to bring out the wavy Athena Bracelet again, and see if I could improve upon it. I certainly wanted to add beaded clasps instead of silver, and perhaps simplify the beadwork to make it come together much quicker - and with less thread. I started with some of my favorite seed beads - abalone lined crystal 11/0's. I matched them up with some light blue Ceylon 11/0's and blue and white pinch bicones. For just a little more contrast, I chose some white lined peridot seed beads that have a nice sea-green color. This time around I tried using square stitch for the beaded panels, instead of peyote. The straight rows of beads are much easier to work with, since they can be stitched straight through to add the loose bead strands. The toggle and loop clasp is also much easier to use than a metallic closure, and blends in with the entire bracelet for a nice clean look. When it comes to choosing elegant precious jewelry, many shoppers have developed an eye for quality craftsmanship. Savvy jewelry lovers know that the very best pieces come in the form of handmade, one of a kind creations. And few can do handmade better than the work from home entrepreneurs that showcase their wares at craft fairs, farmers markets, and at online venues like Etsy and Artfire. It is these crafters and creators that take our favorite materials - and often those we’ve never seen before - and turn them into works of art. They are often imitated, but never duplicated. One incredibly talented designer, Marion McDonald of The Sea Fairies’ Jewelbox, uses her love of color and precious materials to create stunning accessories. Just one look at her collection could turn any department store shopper into a handmade devotee. With a University of California education in Art History, Architecture, and Italian Literature, it is clear why Marion McDonald’s passion for beautiful things shines through in her work. 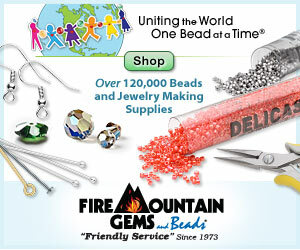 Inspirational Beading: How did you first discover the art of jewelry making? Marion McDonald: I have been making jewelry since I was a little girl. My aunt was an excellent fiber arts designer who made jewelry as well, so I learned my love of it and some technique from her. My first time selling my creations (or trying to sell, anyway) was when I lived in the country in upstate Vermont. I was 11 and made jewelry from discarded telephone wire, and my brother (who was 9) helped me sell it out on the nearest road. Inspirational Beading: Where do you find the most inspiration? Marion: In the natural world, the ocean in particular. Color combinations and textures that Mother Nature comes up with can be both soothing and almost monochromatic, or brightly eye-popping. I pay attention as I go through my day and file ideas away for future use. I also love the color palettes used in period mini-series, like BBC versions of Jane Austen's work, The Forsyte Saga, and Bleak House. The jewelry is often gorgeous, too, of course. 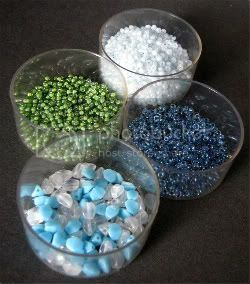 Inspirational Beading: Do you have a favorite material to use in your designs? Marion: I am so fickle when it comes to my favorite gemstones. I got obsessed with andalusite for a while, but my favorite right now is moss aquamarine. It's the most amazing steely blue-green color, like the ocean after a wave crashes, with flinty, foggy bits shot through it. 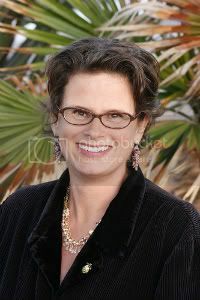 I never wore gold until a few years ago - I was almost 40! I got totally obsessed with it, especially with gold vermeil, which is sterling silver with an overlay of 24 carat gold. It's Murphy's law that I would discover gold when its price is at an all-time high! 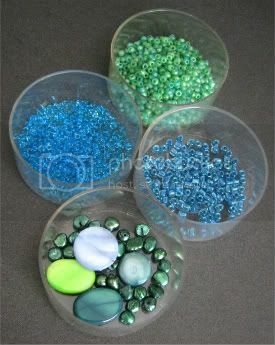 Inspirational Beading: What is your favorite color combination for jewelry? Marion: Oh, I suppose the classic pink and green would be a favorite. Purple and turquoise blue, gold and brown, blue shades all together....don't make me choose! Marion: I'm not sure I inspire anyone, but I do think we need to embrace the beauty in this world. It makes me feel happy and satisfied when clients are so excited with their purchases, whether it's a bride or someone going to a work event, or just a new favorite pair of everyday earrings to kick around in. Marion McDonald has spent much time living in and traveling through Italy. Her mermaid inspired color palettes are a direct result of her summer as an au pair on an island near Sicily. Today, she is a proud stay at home mom. 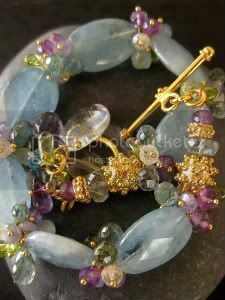 With two young boys - Sam and Leo - in the house, designing jewelry for her shop is a relaxing activity and welcome respite. You can see more of her designs on Flickr, and check in with her latest activities on Twitter. One of my new favorite activities is visiting the library to book hunt on weekends. I've always got a book or two on the go, and I have discovered that there is a nearly endless supply of beading and other creative reading to keep me busy throughout the week. My favorite stop on a tour through the library is the magazines section. I'm always on the look out for great fashion magazines, photography journals, and of course, bead mags. I regularly purchase weaving magazines like Bead & Button, but I am often reluctant to pick up stringing titles. Although there is always a wealth of information and inspiration in every issue, I only buy the occasional copy of titles like Stringing as a rare treat. 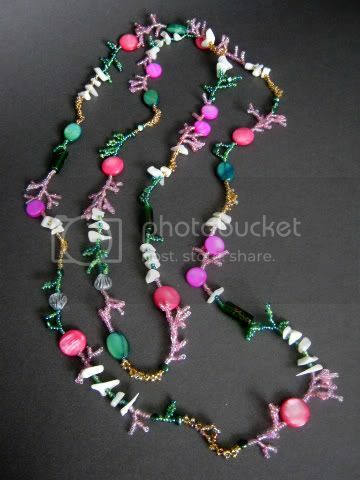 One of my most recent loans from the library was a copy of the March - April 2007 issue of Step by Step Beads. Inside was a fun project that every bead collector should see. “Organized Chaos” by Caren Schwartz is a fun and simple combination of stringing and bead weaving, as well as a great way to use up left over beads. As soon as I saw it, I wanted to give it a try. I had plenty of sandy brown seed beads leftover from my last two projects, and a pink mixture from a necklace I made earlier this year. I paired these up with pink and green shell beads, freshwater pearls, glass beads, and of course some mother of pearl chips. 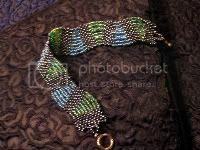 I also added a transparent green seed bead mixture. I adapted the instructions from Step by Step beads a little to make my own chaotic necklace. Instead of knotting several lengths of thread together, I started with about 4 yards of thread. Once the beads for the necklace base were all strung, I continued through to make a circle, and immediately began stitching. This way, the threads could be securely knotted in the heavier beadwork. Instead of using random stitches and embellishments, I added a little more harmony by sticking with particular stitches for each color of seed beads. I used corralling for the pink sections, leaves and loops for the green ones, and free-form peyote stitch for the brown. 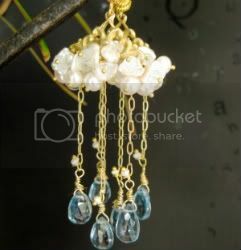 The result is a rose-like chain with an underwater appeal. 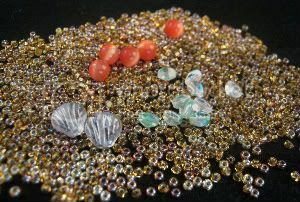 After creating the “Tide Pool” necklace, I still had quite a few caramel and topaz seed beads leftover. I wanted to put the mixture to good use, and started looking through my bead stash to find something interesting to pair them up with. I started by combining my original sandy mixture with another custom brown mix that I had made a few years ago. It included different shades ranging from an almost white beige to dark opaque brown and black. Once I had stirred them together, the urge to create another sandy project took over. I have a seemingly endless supply of mother of pearl chips, so they were my first selection for accent beads. I wanted a splash of color, so I also grabbed some deep yellow shell coins. 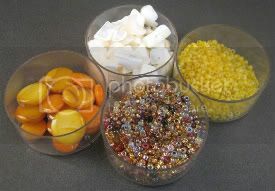 Once these sunny beads were added to the palette, I also threw in some smaller orange shells for a little extra spice. Frosted yellow 11/o seed beads rounded out the palette, drawing the all of the colors together. I wanted to do something simple with the seed beads, to really show off the different colors in the sandy mixture, so I started with some flat herringbone weave. Typically, flat beadwork isn’t really suitable for a necklace, because it doesn’t drape well. To correct this, I connected two strips of herringbone with strands of beads. The soft, flexible bead strands allow for a curve in the middle of the necklace, so the herringbone pieces can lay flat across the neck and shoulders. I omitted the opaque seed beads, and incorporated the frosted yellow seed beads gradually, then created a semi-random pattern of shells in the middle. Each side of the necklace has a roughly equal amount of accent beads. 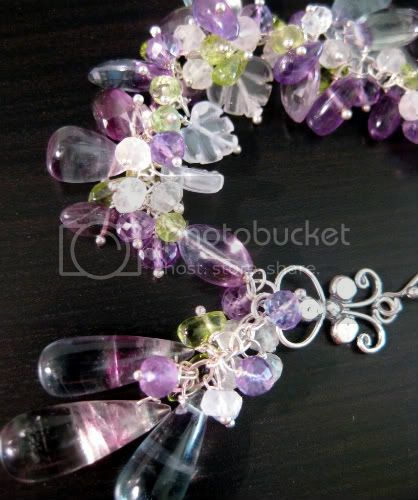 The necklace is finished with a loop and toggle clasp. Of all the amazing animals and plants that live in the sea, there will always be certain creatures that capture our imagination. Marine dwellers such as angel fish, turtles, whales, seahorses, and mythical beings like mermaids always find their way into art, and of course jewelry. I recently purchased this amazing hand carved bone pendant from AuntiesBeads. 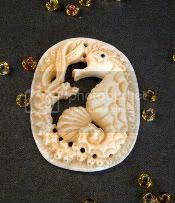 I wasn’t sure how I would use it, but the pretty seahorse design was irresistible. The textured pendant features a lovely ocean scene, including a scallop, barnacles and kelp. 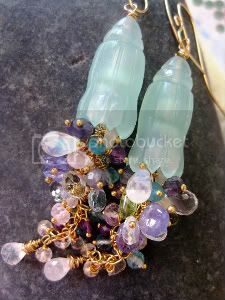 To really bring out the aquatic nature of the pendant, I selected an assortment of blue and green beads. I started with some pretty shell coins and ovals - my favorite are the lime green ones. 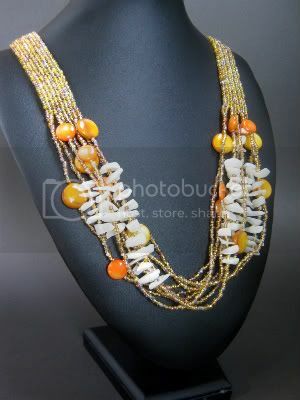 I love the smooth texture of the shell beads. I matched these up with some 11/0 seed beads in frosted lime green, moss green AB, transparent blue, and dichroic lined blue. I also added some forest green freshwater pearl nuggets, and 8/0 sapphire triangles. I really liked the tiny holes that dotted the pendant, and wanted to put them to good use. Rather than string the pendant on a bail, I tacked it to a panel of square stitched triangle seed beads. The 11/0 and 15/0 seed beads holding the beadwork in place created a pretty bubble effect. The square stitch panel also anchors the 16 bead strands that make up the necklace. To gather the strands together, I made little ladder stitch caps and attached the beaded clasp. I’m glad that I chose to string the lime green shells first, so that they stand out at the base of the necklace. Sustainable, natural materials have become more popular with beaders and jewelry designers in recent years. Many of us are familiar with the Tagua Nut beads that are made from excess vegetable matter, instead of our more familiar man-made glass and plastic. Unlike shell, pearl or gemstones, these types of beads are collected with little or no impact on animals or the environment. Thanks to the growing popularity of sustainable living, marvelous products like these are becoming more accessible to artisans and jewelry lovers alike. One company that is helping to inspire a love of natural jewelry is The Andean Collection. Founded in September 2008, this small jewelry company is making waves in the fashion industry, by providing shoppers everywhere with gorgeous accessories made with natural materials - some of which are still rare in the US market. 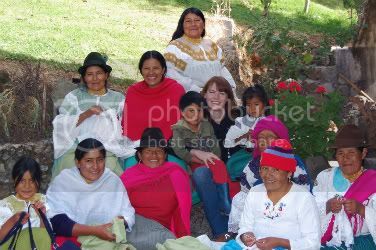 The owner and founder of The Andean Collection, Amanda Judge, has brought new fashion ideas to cities like Boston, San Francisco, Los Angeles, Seattle, and New York, while bringing hope and fair pay to the jewelry artists of South America. Inspirational Beading: What was your first reaction to seeing the beautiful natural bead designs of South America? Amanda Judge: I was simply stunned. I couldn’t believe that these beads were actually natural materials. When The Andean Collection was just the sliver of an idea, I would spend days wandering through the markets of Ecuador asking all sorts of questions so that I made sure that I was learning all I could about the beads. I asked for introductions to the people who dye and process the seeds and visited a lot of home workshops to observe the process myself. Now that I know how the process works and how each seed is handled individually, it makes these pieces all the more interesting in my mind. Inspirational Beading: There’s always something marvelous and special about hand-dyed beads, and the Andean Collection is full of lush shades. Which color is your favorite? Amanda: Definitely turquoise. When the tagua is dyed turquoise, for example in our Riverbed bracelet, it actually looks like large chunks of turquoise stone. It’s so cool. Inspirational Beading: How has working with fair trade affected the way you view jewelry, and the world as a whole? Amanda: I could probably write a book on the answer to this question, but I’ll try to keep it shorter here. It’s not so much working in ‘fair trade’ that has changed my world, but working with the artisans themselves that has impacted my life the most. I talk with the artisans daily or weekly (via email – I’ve taught them how to use email; and cell phones) and in this manner I get to be a part of their day-to-day lives. If they have a problem, like it’s really cold and rainy in Ecuador and they haven’t been able to sleep well, I know about it. If the price of grain has shot up and they’re having difficulty buying enough to feed their families, I know about it. And then I go out and figure out how to increase sales quickly so we can give them more work. This makes me continually grateful for what I have in life. It’s all too easy to get caught up in your own world and take for granted all the niceties you have. Starting a business is extremely difficult and I have definitely had my own moments of maximum stress. During these more taxing times I tend to feel disconnected from Ecuador & the artisans as I get caught up in the operations in the states. Once this starts to happen, I book a flight to Ecuador or make some phone calls to check in with the artisans to see how they’re doing. This reminds me of what I’m working for and gives me the extra push I need to make sure things are successful. My relationship with the artisans just puts my own life into perspective. And a good perspective is amazingly key to a happy life. As far as how working in fair trade has made me view jewelry…I am delighted that big beaded necklaces are all the rave now, but I see so many of them make out of synthetic beads and think, what a shame! The same designs could be made out of natural materials and would be so much more interesting. Inspirational Beading: The Andean Collection features some very unique materials, many of which are new to North American fashion. Which of the natural materials do you enjoy the most? Amanda: My favorite bead is the Pambil seed. From far away it might look like a plastic synthetic bead, but then you notice all the natural irregularities in the bead that make it really dynamic. Tagua is also great as you can do almost anything with it! They call it vegetable ivory because it can be carved and molded into anything smaller than the size of the seed itself, which is about the size of an oversized golf ball. Inspirational Beading: Who do you hope will be inspired by The Andean Collection? Amanda: By focusing on high design, I hope we inspire other fair trade companies to market themselves more to the mainstream so that the movement of fair trade can compete on a larger scale. I also hope that we inspire consumers to ask more questions about what they are buying. If an organization says they are fair trade, ask for photos and videos of the artisans and their testimonials. And ask for evidence that an organization has done the due diligence of examining their entire supply chain. Ensuring that products are fair trade takes a lot of oversight on the part of the organization, and as companies grow that gets increasingly difficult. If anyone is thinking about starting a fair trade organization, make sure not to grow too fast so that that oversight gets lost! I also hope people realize that you don’t need to pay a premium for fair trade, eco-friendly jewelry, nor do you have to sacrifice style to wear ethical jewelry. 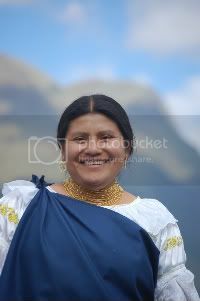 But most importantly, I hope The Andean Collection inspires people to go out into the world and do meaningful, exciting & life changing work – in whatever way you can. After seeing my Moonlit Garden Necklace, many friends left messages for me saying “I love that starfish necklace!” Because I had flowers in mind when I made it, it never occurred to me that the five petals might appear as sea stars. Once I realized the potential of these five sided star creations, I envisioned a necklace covered in tiny starfish. 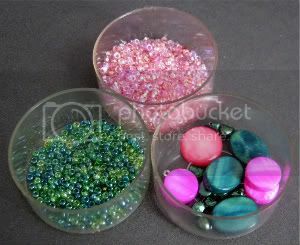 I searched around for the perfect colored beads to create some little sea creatures from. I chose some bright orange cat’s eye beads for the base of some new starfish beaded beads, and found 15/o seed beads to match. 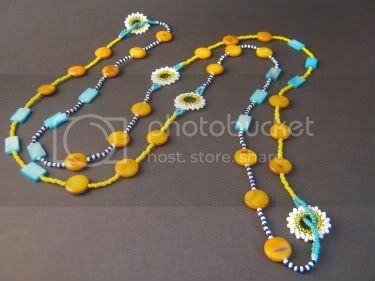 To create a necklace to decorate with them, I selected some lovely green meadow pinch beads, clam shell beads, and a mixture of topaz and caramel seed beads. 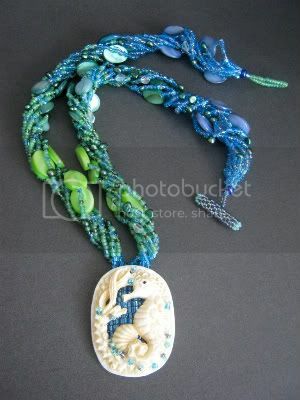 To be sure that the starfish beads were recognized, I wanted to create something that had a strong overall ocean theme. Although I’m not a fan of fishing nets, there’s nothing quite like netted beadwork for aquatic pieces. 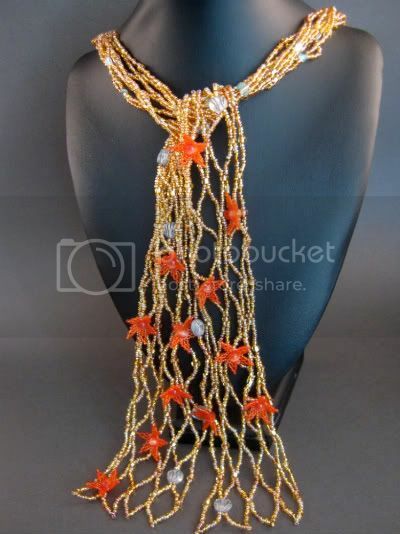 I used the starfish beads and clam shell beads to decorate the ends of a large netted scarf. I’m really pleased with the way the netting turned out. Instead of a fishing net appearance, it looks like water rippling over a bed of golden yellow pebbles.